Lahari Music, the music label, which released many super duper hit albums in the past, is releasing the songs of Megastar Chiranjeevi's 'Khaidi No.150' so far. music score for this movie and the three songs released so far received a 'mega' response. The audio is creating new records. G.Manohar Naidu, the CEO of Lahari Music, said, "Earlier we have released the audios of Megastar Chiranjeevi's 'Master', 'Mechanic Alludu', 'Mutha Mesthri', 'Aapadhbandhavudu', 'Gharana Mogudu', 'Rowdy Alludu', 'Mugguru Monagallu'. They were big musical hits. Now we take pride in releasing the audio of Chiranjeevi's prestigious 150th film 'Khaidi No.150'. The songs released so far are creating new records on Youtube. Ammadu Let's Do Kummudu song has clocked more than 7 million views, 'Sundari' song has crossed 4 million views and 'You and Me' has already crossed 1 million views. We will release the item number 'Rathaalu Rathaalu' on 31st December and the jukebox will also be out on the same day. The film is already creating records. We thank Megastar Chiranjeevi, director V.V.Vinayak, producer Ram Charan and music director Devi Sri Prasad for giving this wonderful opportunity to release this audio. 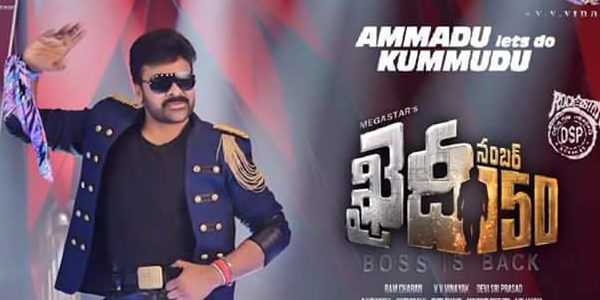 We also thank the Telugu audiences and megastar fans for making this album a mega hit".